The month of May was a turbulent but successful period for the Golden Age Gorinchem Foundation. 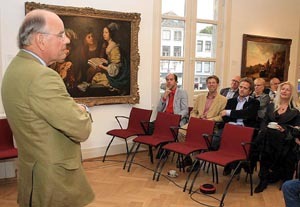 From 1 May 2009, the chair of the Golden Age Gorinchem, Drs. Bert Biemans, MA, has been appointed as a guest-curator for 17th century painting in the Gorcums Museum. On 5 May last, the Golden Age Team obtained two marvellous works at an auction in Amsterdam. One of the paintings is by the artist Jan Olis, born in 1610 in Gorinchem, and depicts a ‘regent’ with a beret; the other painting is by Harmanus Serin, born in Gent in 1677, and it portrays the ‘schepen’ (deputy mayor) of Gorcum, Hubertus Snoeck who is depicted according to the best ‘Medici-tradition’. 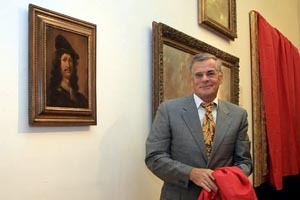 Both paintings have been acquired by a foundation in Gorcum that will lend the works to the Gorcums Museum where they will be exhibited from the end of August 2009. The painting by Jan Olis, below, is the first work by this artist that has come into the possession of Gorcum. It shows a magnificent mug, executed in the style of Rembrandt. The painting, oil on panel with the size 35 x 28 cm, has been signed with ‘Jolis’ on the right. The painting by Harmanus Serin shows the 32-year-old Hubertus Snoeck, deputy mayor at the time and head of the citizen guard of Gorinchem. He has been depicted with a wig, sitting in front of a book case with books of which similar copies are in the possession of the city of Gorinchem. In the background, a sculpture of Hercules with club is visible. 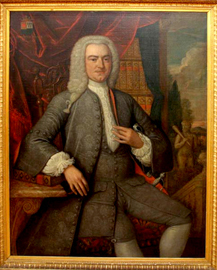 Power and wisdom surround this young ‘regent’, who was portrayed in 1736 by Serin. Serin mainly worked in the regent circles of The Hague, Rotterdam, Delft and Gorinchem. The canvas, signed with H.SERIN F/1736, is oil on panel of 132 x 109 cm and is in a very good condition. A ‘wethouder’ (member of the executive council) of Gorinchem, Bert Biemans, anno 2009, and a ‘wethouder’ of Gorinchem, Hubertus Snoeck, anno 1736. The differences in dress, hairstyle and aura show clearly how the office of ‘schepen’ has changed over time. chair of the FOWW Foundation in Gorinchem. On 20 May last, the Golden Age Team, together with reporter Mrs. Everdien Hamann of the paper De Stad Gorinchem, city archivist Mr. René van Dijk and curator-manager of Castle Heukelum, Drs. 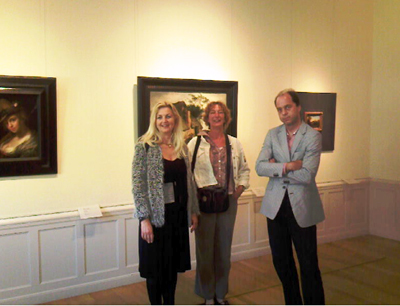 Robbie Dell’Aira, visited the exhibition ‘De collectie Kremer’ (the collection Kremer) in the Frans Hals Museum in Haarlem. Mr. George Kremer himself gave the group a guided tour of which Mrs. Hamann has written an account for ‘De Stad Gorinchem’. In an hour-and-a-half, Mr. Kremer told about his collection, which consists primarily of 17th century paintings, as well as about the manner in which he and his wife Ilone have accrued the collection. 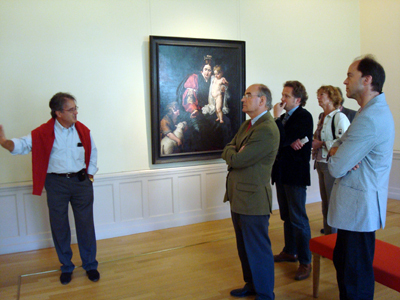 Everdien Hamann and René van Dijk in the Frans Hals Museum. 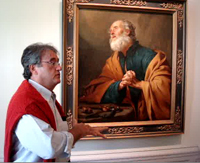 During this visit, Mr. Kremer has promised that two paintings from his collection by Abraham Bloemaert will be lend to the Gorcums Museum for an exhibition about Old Masters from Gorcum during the second half of 2010.
in front of a painting of Abraham Bloemaert in the Frans Hals Museum. 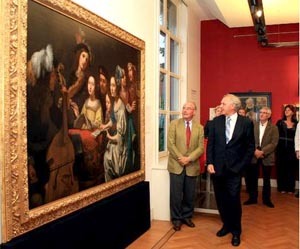 In June 2009, the Gorcums Museum borrowed a magnificent painting by Gerard van Kuijl from the well-known art dealer Smeets from Milan. It is a depiction of a musical company, painted in the tradition of Caravaggio. The work may already be viewed. In the beginning of July 2009, two members of the Golden Age Team visited the Noordbrabants Museum in ’s-Hertogenbosch, which was showing an extraordinary exhibition about still lifes. Especially interesting was a floral still life painting by the above mentioned Jan Olis, who mostly made genre paintings and to a lesser extend portraits. 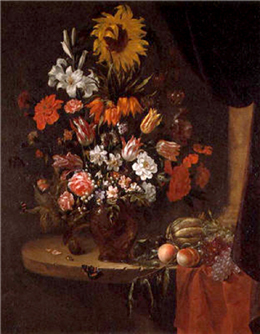 He produced only two well-known floral still lifes. One still life was part of the exhibition and it was considerably different from the recently acquired mug in Rembrandtesque style. On 28 August, the three borrowed paintings by Jan Olis, Harmanus Serin and Gerard van Kuijl were officially unveiled in the Gorcums Museum, in the presence of the Golden Age Team and many invited guests. Mr. Ewald Klaui, chair of the FOWW Foundation unveiled the painting by Jan Olis and the Snoeck family from Hoorn removed the red cloth from the painting of their ancestor, the ‘schepen’ (deputy mayor) Hubertus Snoeck from Gorcum. Mr. Piet IJssels, mayor of Gorinchem, has unveiled the magnificent painting by Gerard van Kuijl, together with alderman Bert Biemans. Gorinchem - 29/08/2009 - On Friday night, 28 August, an extraordinary event took place in the museum on the Grand Market. No less than three new paintings were unveiled. This was especially made possible by the work of The Golden Age Team. This Team consists of Drs. B. Biemans MA, (chair), Mrs. J.A. Ardesch, (artist and councilmember in Gorinchem) and Mr. Kreszner (curator of the Gorcums Museum). The activities of The Golden Age Team consist of identifying paintings, drawings and etchings of 17th century painters from Gorcum or works from other Old Masters who have made paintings of Gorcum, that are eligible for acquisition by the Foundation. Lending paintings to the Gorcums Museum for a longer period of time is also one of the possibilities. The Team visits fairs, exhibitions and auctions at home and abroad. On 5 May last, The Golden Age Team obtained two beautiful paintings at an auction in Amsterdam. The first is a painting by Jan Olis, born in Gorinchem in 1610, depicting a ‘regent’ in a beret. The second is a work by Harmanus Serin, born in Gent in 1677, that portrays the ‘schepen’ (deputy mayor) of Gorcum, Hubertus Snoeck who is depicted according to the best ‘Medici-tradition’. Both paintings have been acquired by a foundation in Gorcum that lends the works to the Gorcums Museum where they can be seen from this moment. After the opening statements by Rob Kreszner and Bert Biemans the people present moved to a different room with the three unveiled paintings. The fist painting that was unveiled was that by Jan Olis, born in 1610 in Gorinchem and a former mayor of Heusden. This is the first canvas by this painter that has entered into possession of Gorcum. It is a magnificent mug, executed in a ‘Rembrandtesque’ style. The painting shows a portrait of a so-far unknown man with a brown beret. When it comes to the play of light, style and shine, it is a ‘Rembrandtesque’ work, oil on wooden panel. Chairman Ewald Klaui of the FOWW Stichting, Foundation Development Living and Welfare, had the honour of unveiling this painting. Thanks to the support of this Foundation it was possible for The Golden Age Team to bring this painting to Gorinchem. The painting by Harmanus Serin depicts the 32-year old Hubertus Snoeck, at the time deputy mayor and head of the citizen guard of Gorinchem. He has been portrayed with a wig, sitting in front of a book case with books of which similar copies are in the possession of the city of Gorinchem. In the background, a sculpture of Hercules with a club is visible. Power and wisdom surround this young ‘regent’, who was painted in 1736 by Serin. Serin mainly worked in the regent circles of The Hague, Rotterdam, Delft and Gorinchem. The canvas, signed with H.SERIN F/1736, is an oil on canvas of 132 x 109 cm and is in a very good condition. 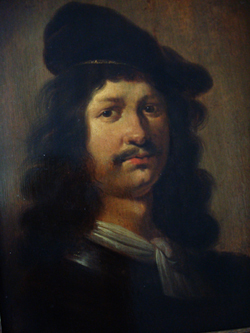 The painter Harmanus Serin (born in Gent in 1677) was a travelling portrait artist who painted dignitaries in The Hague, Dordrecht, Delft and Gorinchem. He worked in the tradition of the famous De Medici Family from Florence. At that time, that was the top brass. This painting was unveiled by the Snoeck family from Hoorn. 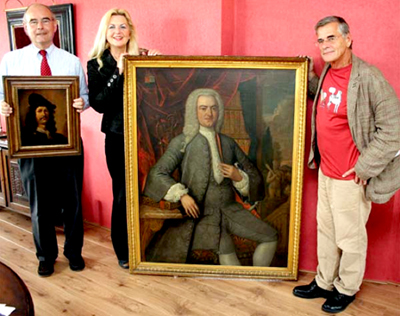 Mr. and Mrs. Snoeck and their two sons had read on the internet about the acquisition of the painting. Being descendents of the depicted man, they had contacted The Golden Age Team who appreciated this so much that they gave the family the honour of unveiling the painting. Father Remco and his sons Edgar Remmet and Timothy Matthijs did this with great pleasure. This painting was unveiled by the Snoeck family from Hoorn. 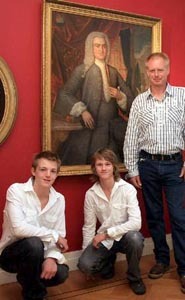 The couple Snoeck and their two sons had read on the internet about the acquisition of the painting. Being descendents of the depicted man, they had contacted the Golden Age Team who appreciated this so much that they gave the family the honour of unveiling the painting. Father Remco and his sons Edgar Remmet and Timothy Matthijs did this with great pleasure. It was remarkable to see the similarities between the portrayed Hubertus and the father with his sons. One of the sons stood out in the respect. 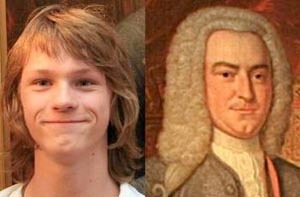 When he smiled the resemblance was so strong that he looked like a young version of Hubertus Snoeck. 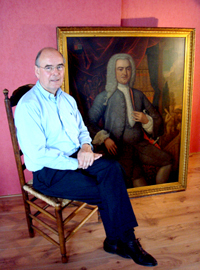 In June 2009, the Gorcums Museum borrowed a magnificent painting by Gerard van Kuijl from the well-known art dealer Smeets from Milan. 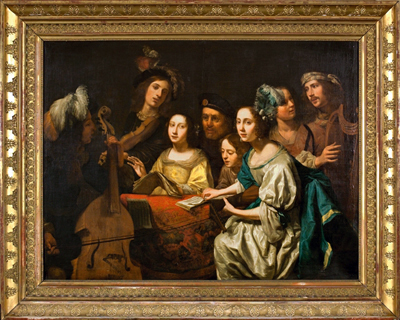 It is a depiction of a musical company, painted in the tradition of Caravaggio. Mayor Piet IJssels was given the honour of unveilig this third and last painting, but he called upon Bert Biemans to join him in this task.